This magnificent medieval Gothic cathedral in France has nearly 200 bright-hued stained glass windows dating back to the 12th and 13th Centuries. 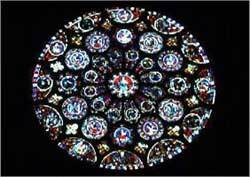 The huge roseate windows (see photo) above the cathedral's main entrances are particularly spectacular and justifiably world famous. The outdoor sculptures of Chartres are almost as famous as the stained glass windows. They adorn the edifice's exterior around the doorways. Most visitors come from Paris on day tours. This wonder is located in its namesake city, Chartres, just about 100 kilometers (60 miles) southwest of Paris.